There are all kinds of exciting classes for 2013 so please keep checking as you will need to book early to secure a place. Sunday 21st April 2013 first day of Art Clay Silver level 1 certification with Lynne Glazzard. This is run by me as a four day course following the syllabus set out by Aida Corporation and can either be four consecutive days, two pairs of two days or four separate days within a one month period. I only run this twice a year at the moment so please contact me as soon as possible if you are interested. 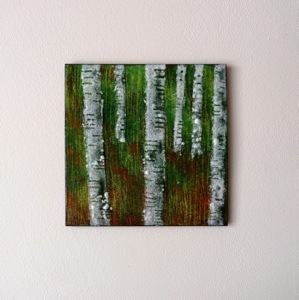 Saturday 27th April 2013 Landscape into Enamel with Tilly Wilkinson £150 per person plus cost of copper available to purchase on the day. Using a range of enamel techniques produce a landscape based wall panel from your own images. You will incorporate a range of techniques including sifting, scrafitto and stencilling to produce your own personal response to a landscape that you love. You will learn how to prepare, counter enamel and finish your copper. A range of enamels are included in the price. Copper in various sizes will available to purchase on the day. Saturday 1st June Introduction to enamel painting with Tilly Wilkinson £175 per person including all materials – During this 1 day class you will learn how to create your own miniature piece of enamel painting. You will be provided with pre prepared copper bases and a range of stimulus material to work from. You will look at techniques for transferring your chosen design onto the fired enamel surface prior to painting. Using finely ground enamel pigments you will be shown how to prepare them for your palette and how to apply them to your prepared base. No experience is necessary but some interest or ability in either oil or watercolour painting will be helpful. 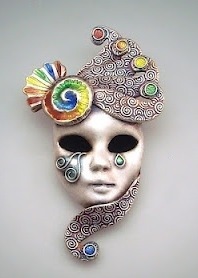 29th & 30th June 2013 Carnival masks with Joy Funnell £385 per person, including materials (see previous post for more details) Advanced booking is essential and this class is filling up. 21st & 22nd September 2013 Enamel painting with Tilly Wilkinson £325 per person including materials During this 2 day class you will learn how to create your own miniature piece of enamel painting. We will cover how to press form and prepare a suitable base from copper shim, how to apply a suitable enamel layer on which to paint and how to fire it. In addition we will look at techniques for transferring your chosen design onto the fired enamel surface prior to painting. Using finely ground enamel pigments you will be shown how to prepare them for your palette and how to apply them to your prepared base. Enamel painting is suitable for representing a range of imagery from representational portraits to abstract designs. This class would be most suitable for those who already have a reasonable level of ability in either oil or watercolour painting and some enamelling experience.